Whenever a particularly surreal or confusing movie is released, the first instinct of the viewer might be to ask what the hell it was all about. Go to the message board for any David Lynch movie and you’re bound to come across someone either asking for an answer or claiming to have one. Denis Villeneuve’s psychological thriller “Enemy” is among the latest films seemingly begging for someone to solve them, but maybe that’s not the best approach to watching it. Scott Meslow of The Week wrote an article tackling the film’s bizarre imagery and maddening ending, and why finding an airtight explanation for the film is missing the point. This is an increasingly common approach: the idea that a seemingly inscrutable film is just a puzzle waiting to be pieced together. But “Enemy’s” effect is achieved, in part, by the fact that the various elements of its story are impossible to reconcile. As Stuckman correctly notes, there are plenty of hints that Gyllenhaal and his “double” might be the same person — or, at the very least, that the lines between them are uncomfortably blurry. But there are also several scenes that don’t work if Gyllenhaal’s double isn’t a real and separate person: an awkward encounter outside a university, a fight over a missing wedding ring, and a fatal car crash that’s independently reported on the radio. Those scenes don’t fit into the explanation Stuckman has constructed, so they’re glossed over or ignored. He goes on to write that “Enemy’s” ending is more important for its emotional impact than its meaning, and that it’s a film that’s meant more to be experienced than explained. 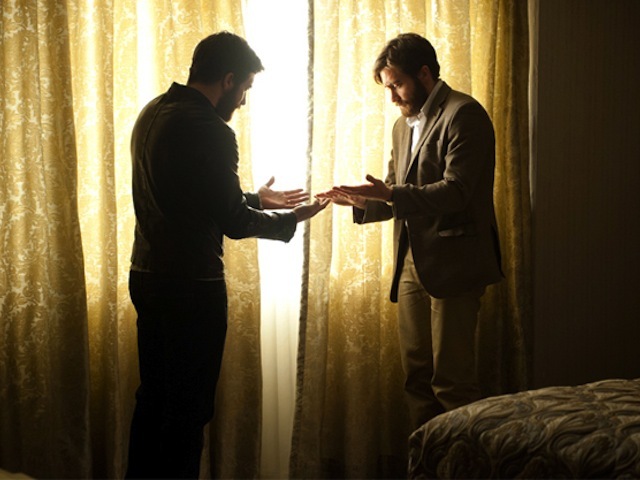 Personally, I strongly disliked “Enemy,” not because it didn’t make sense, but because Villeneuve directs with a suffocatingly dour and portentous touch that makes experiencing the film’s strangeness feel one-note and dull rather than unnerving. A number of reviews compared it to Roman Polanski’s “The Tenant,” which I prefer for its unhinged terror and moments of comical bizarreness (see: Polanski’s character slapping a child for no discernible reason). Same goes for “Eraserhead,” which is frequently as funny as it is horrifying (Mr. X’s fatherly kindliness amidst all weirdness never fails to make me laugh). But I think Meslow’s right when he says that trying to find the point to “Enemy’s” surreal storyline misses the larger point. If the film works for you, it’s because it drops you into a bizarre and unsettling world for 90 minutes. This speaks to a larger issue in moviegoers and TV fans trying to solve everything whether or not it’s a puzzle – every ambiguity has to be a clue to something much larger. But that robs so many films of their power. Would “Picnic at Hanging Rock” or “L’Avventura” benefit from solutions to the mysteries that Peter Weir and Michelangelo Antonioni weren’t interested in solving? “Room 237” is a fascinating look at movie obsession, but the film doesn’t reveal what “The Shining” is about so much as it reveals that the film is practically designed to be a cinematic Rorschach test. This could extend to horror films as well, where rational explanations for what’s going on often make the films less interesting. “Halloween” was frightening because there was no explanation for Michael Myers’s actions or his unstoppable nature. When it was explained in “Halloween II” as “it’s because Jamie Lee Curtis is his sister,” it became banal. “Psycho” is more frightening if you ignore psychiatrist Simon Oakland’s explanation of Norman Bates’s psychosis and instead accept that it’s far beyond rational explanation, as I’d argue the final scene suggests. The question of “Why this girl?” in “The Exorcist” is answered in the much-derided “The Version You’ve Never Seen,” to the film’s detriment: With no answer, it’s a Bergman-influenced meditation on why God allows bad things to happen to innocents; with an answer, it’s less interesting. If there’s nothing more frightening than the unknown, why make it known? I recently caught up with Krzysztof Kieslowski’s “The Double Life of Veronique,” which features two characters played by Irene Jacob, one Polish and one French. When something happens to the Polish Weronika, the French Veronique feels it, but can’t explain it. Some have interpreted the film as an elaborate metaphor for Poland and France’s connection in post-World War II Europe, but even if that’s what it means, that explanation has nothing to do with what’s so remarkable about the film: the gorgeous yellow-hued cinematography, the scenes of Weronika lingering in the rain to finish a song in her haunting soprano, Veronique being moved to tears by a photograph of Weronika that she didn’t know she took. Most of what’s great about the film is intuitive rather than intellectual. So perhaps it’s time to dispose of the decoder rings and accept that some films are better left unsolved, or at very least that the solutions are less interesting than the questions.